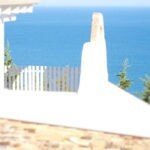 Getting married and looking out on the sea is many couples’ dream. 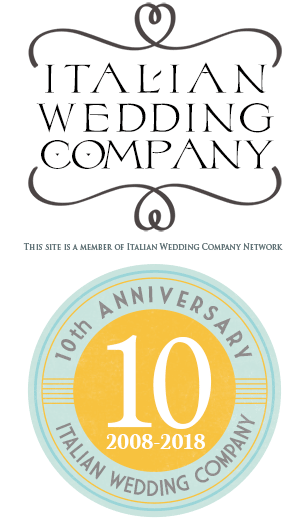 Adriatic Sea in ​​Puglia is surely a great destination for your Italian wedding to the seaside! 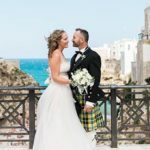 Francesco and Serena chose to get married in an elegant wedding venue on Gargano region in Apulia, with a beautiful and special view over Adriatic Sea. Their wedding style and wedding theme? Italian sea, love, tradition, simplicity and passion for Puglia, “their” land somehow. Serena and Francesco live in Bologna, they have Neapolitan and Pugliese origins. 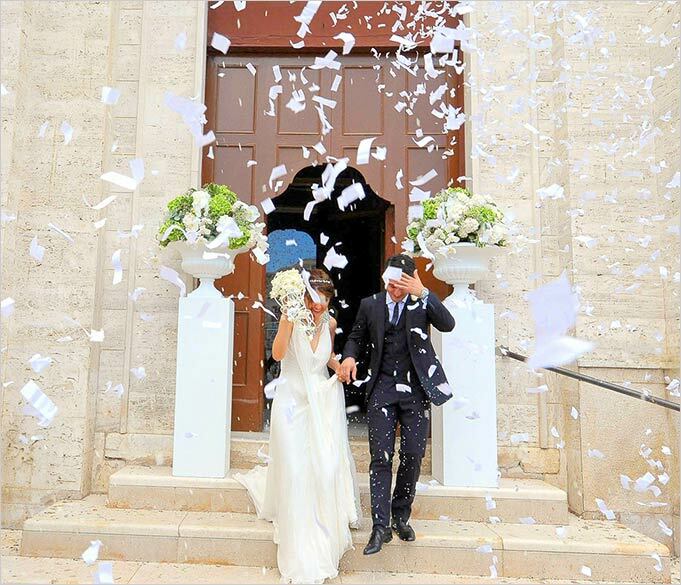 They chose to celebrate in beautiful and enchanting Apulian landscape. 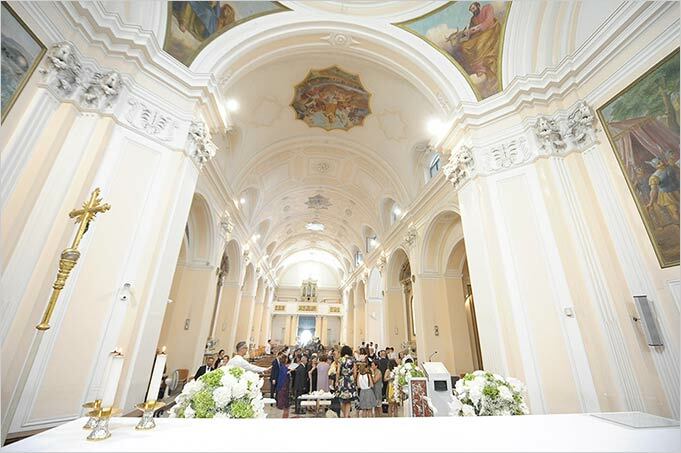 Serena and Francesco choose to celebrate their wedding with a Roman Catholic ceremony in the beautiful Cathedral of San Lorenzo Maiorano in Manfredonia. Manfredonia the town where Serena preserves her most pleasant memories of when she was a kid. She is deeply connected to this town. Serena arrived to the church on a white Wolksvagen Convertible Beetle. Sun shined wonderfully and Serena holded in her hands an elegant white laces umbrella. When she arrived at the church she enchanted all her guests! 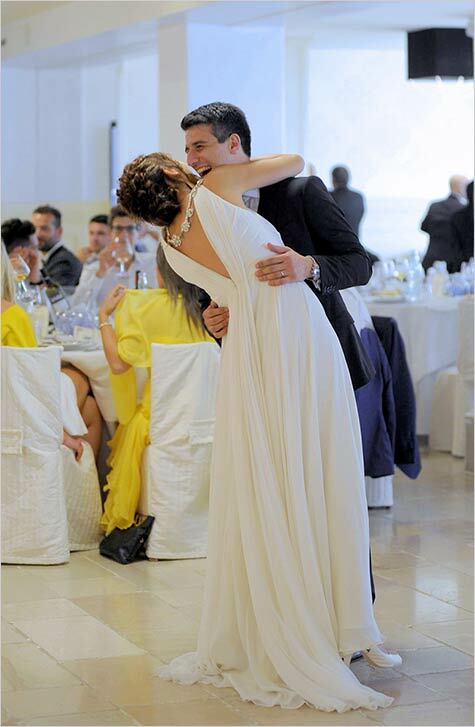 She wore a wedding dress signed by Errico Maria in candid white. She was divinely, impersonating her simplicity with style and elegance. Her hair gathered from a brilliant clasp brightened and enhanced her face. The entrance to the church was enriched by voluminous vases with white orchids and white and green hydrangeas. The nave of the church was embellished with flowers perfectly in style with the bride’s desire. It was a moving and emotional Roman Catholic ceremony. At the end of the ceremony, after the traditional rice throwing to toss the bride and groom outside the church, friends and relatives, between emotion and smiles, wanted to capture some photos in the beautiful square in front of the Cathedral. 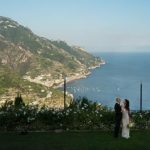 While the guests reached wedding reception venue, Serena and Francesco followed their photographer Leo Guerra. 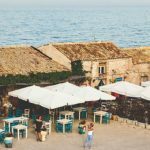 they wanted some shots in the small town, overlooking Adriatic sea. Humor and romanticism accompanied those moments. Friends and relatives, bride and groom were all part of an event organised to the smallest detail. Personalized table plan with shells, sand and candles indicated the names of guests and tables, each table had the title of a song, and the marker with the most significant text of that song. Bride and groom choose songs titles based on their most intense memories. The personalised place cards were small bottles of bath salts with a thank you note for each guest. Wedding reception continued with dances, joy and warmth of friends and family. They all tasted a delicious wedding menu, made with the highest Apulian quality food accompanied by the best wines of Apulia region. A Cigars & Rum corner cigars entertained the most demanding guests, photobooth amused everyone all all ages! The pleasant live music entertained all guests. Bride’s father wanted to make a precious moment magical by dedicating and singing for her daughter and the new son-in-law. So sweet! 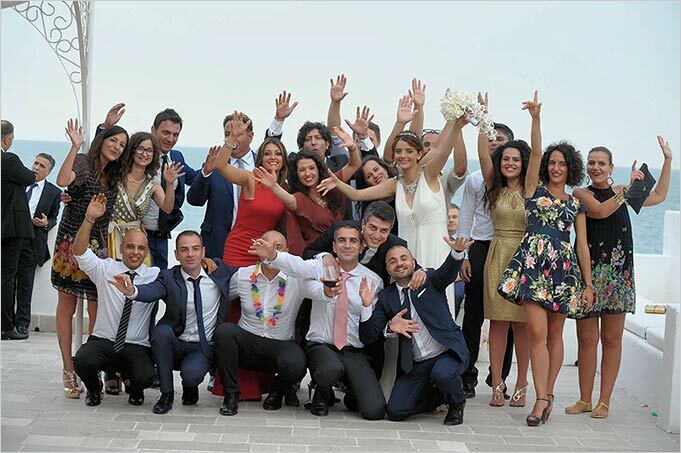 The evening continued pleasantly on the terrace of the wedding venue the pleasant sound of Adriatic Sea, the scent of Apulian summer and the magnificent atmosphere has given to Francesco and Serena and their guests a magical wedding. Their dreams came true…. live and breathe Puglia! 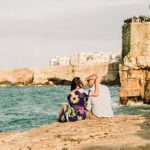 If you want to give yourself and give your guests a unique experience that will keep in their hearts forever Puglia is your perfect destination. We are waiting for you to experience this wonderful experience! Hi Bernadette, thank you for your comment. Shortly I will send you all the details.